Al Massira is a thirteen-part video presentation of “A Journey with the Prophets to discover the Messiah”. The name Al Massira conveys the idea of a journey together with friends and the resource provides a valuable tool for a group of people of a Muslim background to learn together about the Christian message. Beginning with Adam, the presenter takes the participant on a journey through thousands of years of Biblical history, and locations in eleven nations. Each of the featured prophets introduces themes that point the way to the coming of Jesus Christ, the Messiah. Al Massira was developed in Arabic, but is now available in more than fifteen languages, including other Muslim-majority world languages such as Turkish, Farsi and Indonesian. Since the launch of the resource in 2010 over 7,500 people in nearly 50 nations have been trained to use Al Massira as a tool for evangelism and discipleship. An Indonesian movement of more than forty thousand believers from Muslim background are using it for discipleship. Churches of new believers have been started and there has been a wonderful response to the gospel in the lives of Middle Eastern refugees in many locations. 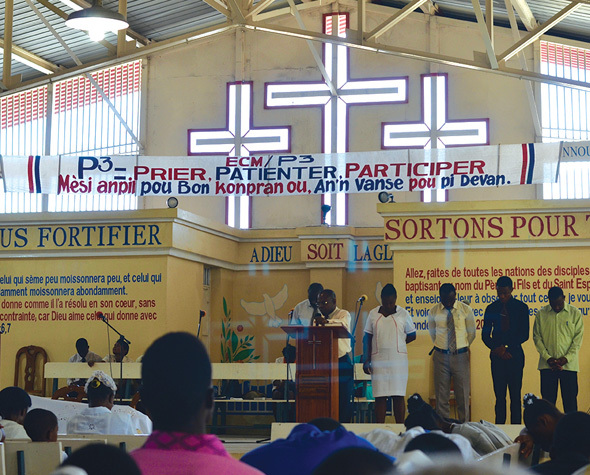 The Purpose of Haiti Outreach Ministries is to share the gospel, grow communities and plant new churches, with the aim to see these communities become independent. To do this, three elementary schools and one secondary school have been founded to date. HOM has also set up four water treatment facilities and established a medical clinic. Additionally, they have offered scholarships for students elsewhere to attend secondary schools and colleges. Unemployment is one of the greatest problems for Haiti. Eighty percent of the people where HOM ministers are unemployed. Education is one of the best ways to help local people gain employment. This understanding has resulted in continuing construction of schools and the medical clinic to meet this great need. In addition, church leaders are trained and mentored. Third Church has assisted this work through construction teams and hosting Vacation Bible school sessions. Founded in 1986 by Dois I. Rosser, International Cooperating Ministries is a 501(c)3 evangelical nonprofit located in Hampton, Virginia. Its vision is to have a healthy, reproducing church within walking distance of everyone in the world. They do this by partnering with indigenous church leaders to equip local churches with two vital resources: a permanent church building and practical discipleship for oral learners. To date, they have built over 7,000 churches in 86 countries and have translated a complete Bible survey in 43 languages. This has resulted in more than 33,000 new church plants and more than a million people discipled to reach their community for Christ. Third Church and its members have had global impact by sponsoring 156 church projects in 37 countries that provide a place of worship for over 31,000 believers, or an average of 204 at each church. International Training Alliance exists to train and multiply leaders on mission globally. A partnership of nine mission organizations, it provides a ministry to frontline missionaries and national workers that no other organization is doing. ITA gives transferable tools and practical skills to leaders, with minimal cost to them, which increase their level of effectiveness to lead and train others. The Leadership Matters Course (LMC), ITA’s agship training offered in 34 nations, is more than just another course on leadership; it is an experience that changes life perspectives, creating a fresh approach to leadership. ITA completed its ninety-fourth Leadership Matters Course in January 2018. Martin de Lange, an OM missionary from South Africa, participated in ITA training 14 years ago. It changed his life and ministry, helping him to organize his team to start a new business as mission, launch literature distribution points, and plant four churches in Turkey. Martin is one of 3,000 missionaries and national leaders who have bene ted from ITA training. Dennis Jackson, executive director of Global Partners, took ITA training in 2009 in the UK. Since that time, this training has impacted the entire mission organization, giving their leaders a common language to energize their efforts for more effective service. Like Global Partners, 190 mission agencies have sent leaders to ITA courses. Our prayer is that the global church will be better equipped to advance God’s kingdom more effectively, so that all peoples have the opportunity to hear the gospel. Thank you, Third Church, for partnering with ITA! With the fall of the Iron Curtain in 1991, MTEE was begun with a keen desire to spread the gospel and train leaders in the former Soviet nations. The initial work was concentrated in Central Europe (Slovakia, Poland, Hungary, Romania and Bulgaria). Many Bible schools were formed and housed in churches where leaders were discipled, with more than 12,000 students participating. Over time, opportunities arose in Ukraine, Moldova and Russia. In Ukraine alone, more than 1,800 students a year were trained in over 55 different Bible colleges. Leaders were able to receive Master’s level training; in addition, a Doctor of Ministry program was developed which has had three graduating classes, enabling teachers from Ukraine, Belarus and Russia the certification to train their own countrymen. The vision of MTEE is to train nationals to transform nations. With recent economic and geopolitical wars, MTEE seeks to stabilize national leaders and teachers with financial support as they reach further with the gospel. Programs are in place in Ukraine, Belarus, Moldova, Poland, Bulgaria, Spain and Russia, and a new initiative has begun with a five-nation cooperative agreement to reach out to the Slavic diaspora in the U.S., Brazil and Canada. Training leaders within these Western countries will have a great impact on furthering cross- cultural evangelism, reaching foreign fields with trained leaders and further resources. The Outreach Foundation seeks to engage Presbyterians in Christ-centered evangelistic mission for the salvation of humankind. Through relationships with missionaries and projects with global partners, we help to create and sustain mission partnerships that build up the body of Christ for God’s mission in the U.S. and around the world, helping individuals and congregations to participate in the amazing things that God is doing in the world. SAT-7 is a strategic evangelical ministry of five satellite TV channels that reach out with the gospel message to millions of people living in the MENA (Middle East and North Africa) region. SAT-7 sends broadcasts to 25 countries in Arabic, Farsi and Turkish and is free of charge, free to air, easy to access, and safe for viewers to watch in remote areas and restricted countries. SAT-7 has gained respect and credibility over its 21 years of ministry, and its viewing audience has surpassed 21 million. Security and protection are growing concerns as many recent attacks have targeted Christians in Egypt and other Arabic-speaking countries. The change of leadership in Turkey also may result in more restrictions on the freedom of media. SAT-7 Academy, the most recently added channel, provides basic education to millions of displaced and refugee children from Syria and Iraq who currently have no access to schooling. 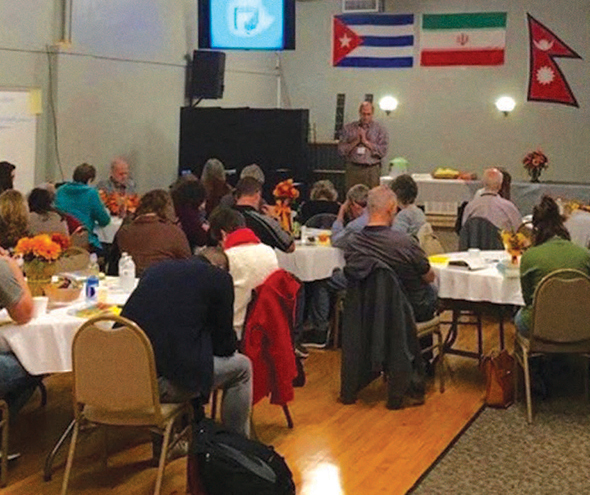 Short-term goals of SAT-7 include 1) engaging more churches to embrace its ministry, 2) raising the bar of partnership in helping local churches in the MENA region add and equip new believers to their membership, and 3) seeking resources to continue producing needed programs for all of their channels. At Shelter of Love, children are given clothing, food, shelter and education. Many of them have never attended school, and they are brought up to the proper grade level. Daily class offerings include English and scripture. They learn to play musical instruments and to use computers and sewing machines. A woodworking program provides the opportunity for boys to craft and sell wooden items. Students plant and raise some of their own food in a greenhouse on site. Several of the students have graduated from high school and gone on to jobs, trade school or college, in fields including business management, tourism, veterinary science and chemistry. The seed of TFT was planted in 1956 when God called Jeanette Brannan at age 13 to be a missionary in Africa. Decades later, a mission trip to Tanzania in 2008 changed her life and the lives of many children and adults in Tanzania. God opened doors never imagined to form a volunteer organization that would provide educational, medical and missional support to people throughout the country. The Board of Directors provides strategic vision, planning, and teams with Tanzanian pastors, educators, physicians, and businessmen to identify the greatest needs and the best approach for assistance and relief. Currently, TFT sponsors the education of 80 students in preschool through masters programs. Many of these students are in private schools, providing them better opportunities to reach their academic potential and prepare for a career. Several students have received bachelors and masters degrees and are now productive community leaders as well as essential TFT leaders. TFT has a history of strong support of education in the areas of nursing and higher medical training. They have begun a signi cant partnership with the recently founded Mount Mbeya Medical College, which will serve nursing and pharmacy students and, in time, medical students. The construction of Save Life English Medium School, which will target orphans and other disadvantaged children in southern Tanzania, will begin in 2018. TFT has also funded several deep wells and is currently having a very deep well dug in the driest area of Tanzania. These wells service hundreds of people in each village and positively impact the economy of the area.